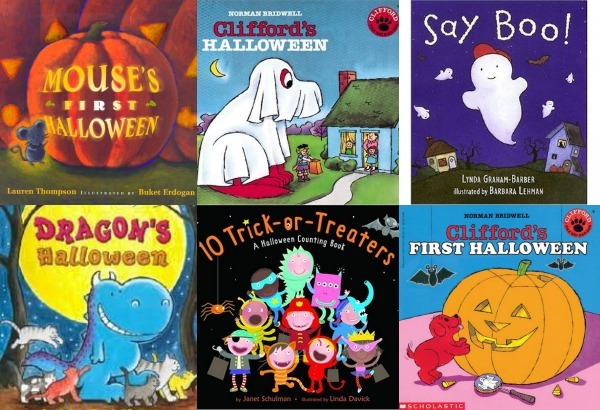 When Clifford was a puppy, this is the story of his first Halloween from trick-or-treating to candy apples to pretend haunted house. Very cute story that my daughter loved. Clifford is all grown up now and last year he went as a ghost and tried to play the games at the Halloween Party. What will he be this year? A book of three short stories. First Dragon is making a jack-o-lantern, but his friends laugh because it’s not scary, till he stacks them all up on top of each other then he scares himself. He goes to a costume party dressed up as three different costumes together but it rains on the way and his costume is wrecked. His friends laugh till a pumpkin gets stuck on his head and everyone is scared of the “monster.” But it’s only Dragon. Finally he’s in the middle of the forest when he hears this scary growling sound. He’s scared till someone tells him it’s only his stomach! Cute stories and illustrations. Halloween counting book, nice pictures, glossy paper. It’s not too scary. Little ghost can’t say boo! First he says Whoo, then Moo, Then Coo and finally cries Boo Hoo and realizes he can say boo! Animals inform him that ghosts don’t say whoo, owls do and that cows say moo and birds say coo.